A cold, wet and windy night couldn’t keep Melbourne’s high-fashion set away from the monthly Fashion Torque evening at the Globe Cafe, hosted by Jenny Bannister and birthday boy Philip Boon. In fact, the air conditioning was set to high inside creating the chilly environment necessary to facilitate a discussion on ‘Doramania’ – the obsession of owning furs. L-R: Jenny Bannister in dashing fox tricorn, JC Lloyd Southwell-d’Anvers of Madam Virtue, Anna Byrne Editrix of Herald Sun Fashion, and renowned stylist Philip Boon overseeing Fashion Torque. I hadn’t been to a Fashion Torque previously (admittedly, much remiss of me) and so I jumped at the chance to attend the most recently event focussing on fur. I attended with my beautiful niece Alexandra (you’ll see some photos of her shortly) and enjoyed a highly informative evening which touched on ethics, style and cultural philosophy. I also had the opportunity to spend time with my fabulous client Jane Hayes, have a quick catchup with colleague Kyra Pybus of Pybus PR, plus natter to Loveena Guilford (Styled With Love) and Sarah Conners (accessories and handbag doyenne). All in all – a fabulous night. Until attending this discussion, my own opinions and understand of fur as an industry and an icon were relatively limited. Fur was discussed as wearable artwork, one of the oldest fabrications of clothing and an item which retains value. 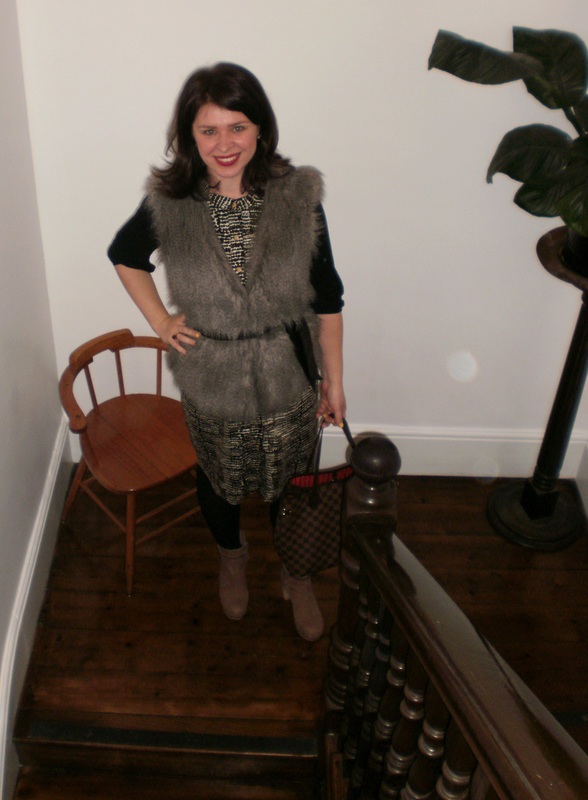 JC Lloyd Southwell-d’Anvers has an incredible knowledge of the fur industry, telling us about Fendi’s important role in the recent popularity and fascination in furs. Fendi are the largest producer of furs in haute couture, working with Scandinavian minks and sables – they popularised the knitting of fur into scarves. JC touched upon the fact that in western culture, fur is associated with wealth and power – he noted that many celebrities coveted and enjoyed fur including Ashton Kutcher, Sean Combes, Sharon Stone, Elle MacPherson and Naomi Campbell. 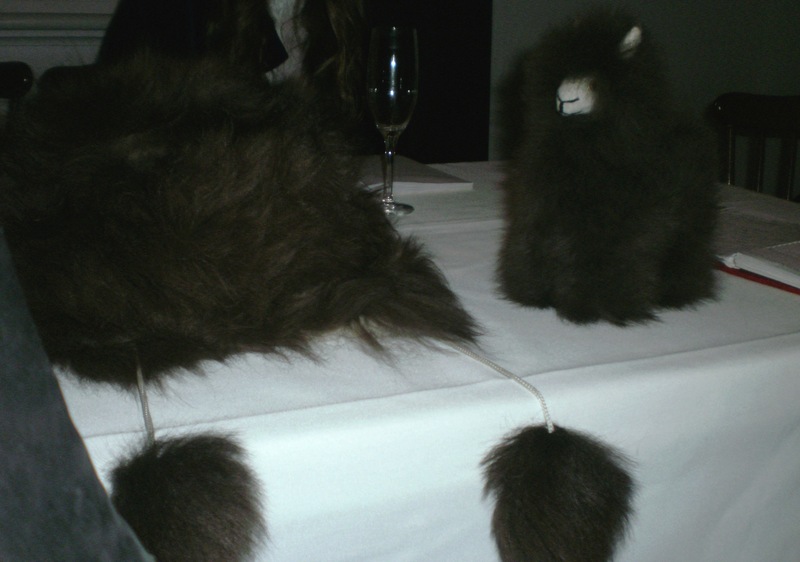 JC also had an amazing ‘magician’s’ gag of luxurious furs for us to touch and look at, including a very cute alpaca hat and toy and a vicuña wool blanket. Cute alpaca toy and hat with pom-poms. Philip looked great in it! 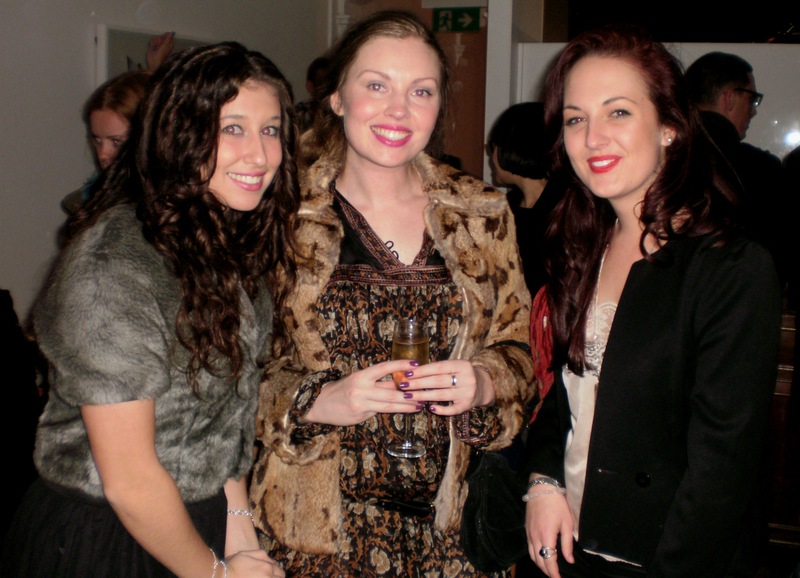 Jenny spoke about her use of fur in the design of outfits for the staff of 1982’s Inflation nightclub. She created a thylocene-themed collection of pieces, including long tail coats with kangaroo tails intact and natty hats. The outfits were so outrageously extravagant and controversial that Laurie Leavy from the Wildlife Protection Society criticized her publicly – eventually the outfits were removed from the staff at Inflation, but the Art Gallery of NSW did purchase them for their collection. 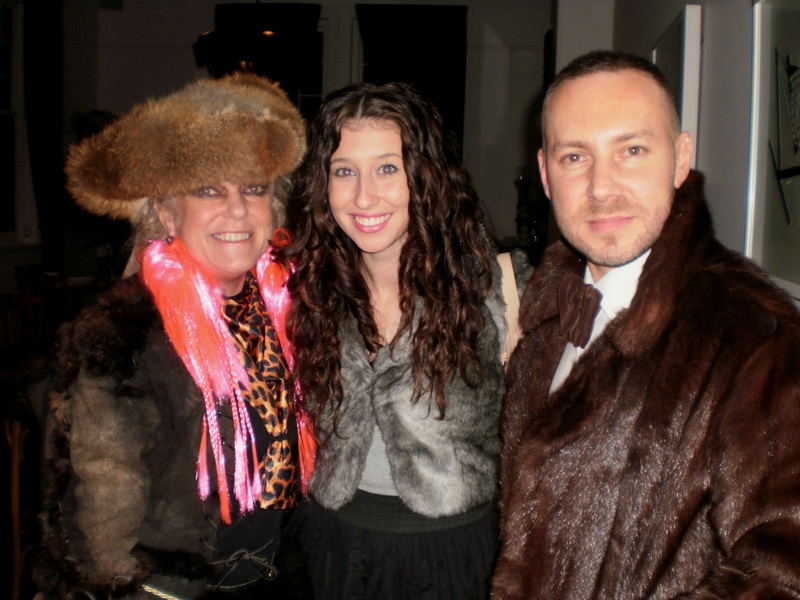 Furcryin’ out loud: Jenny Bannister, Alexandra Scoleri and Philip Boon staying toasty warm in various pelts (both real AND surreal). 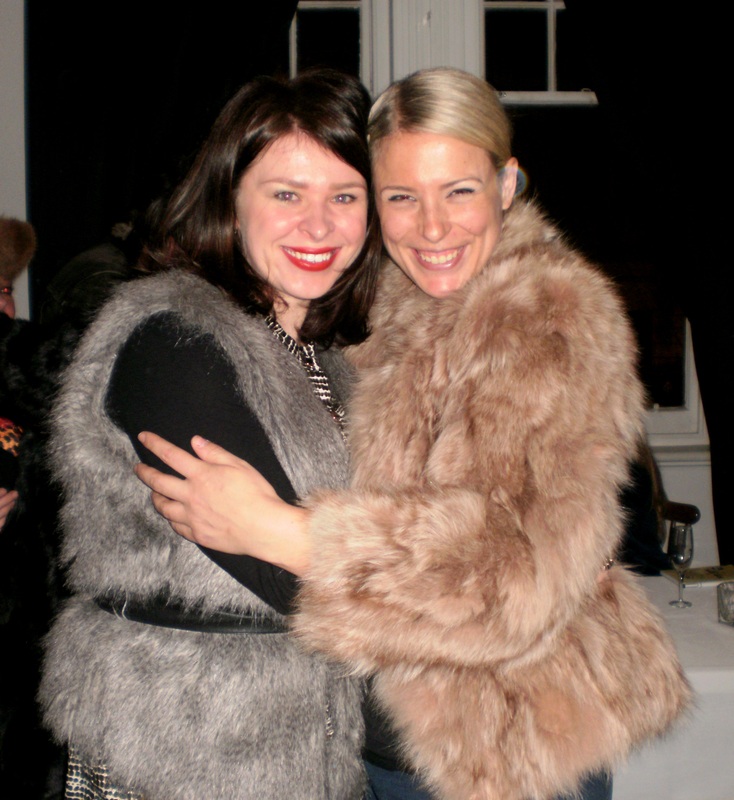 Anna Byrne discussed how the Herald Sun has a policy of not running fur (faux or real) in their feature editorials. She recalled an inexpensive faux fur scarf that when featured which caused tremendous uproar – the price point for the item was inexpensive, and Anna felt that she didn’t need to identify it as ‘fake’ due to its sheer affordability. She received negative feedback and numerous letters – including disapproval from government bodies on the editorial. Anna also noted that ‘anti-fur’ values don’t necessarily correlate all the way through a consumer’s purchasing decisions. Some people feel anxious about fur products, but have no concerns about leather shoes (for example). Philip Boon is a vegetarian, but he loves wearing fur. One of the serious piece of fur on show – check out this ostrich bad boy. Cripes! The discussion of fur and culture soon came around – in Australia we associate fur with wealth and privilege. 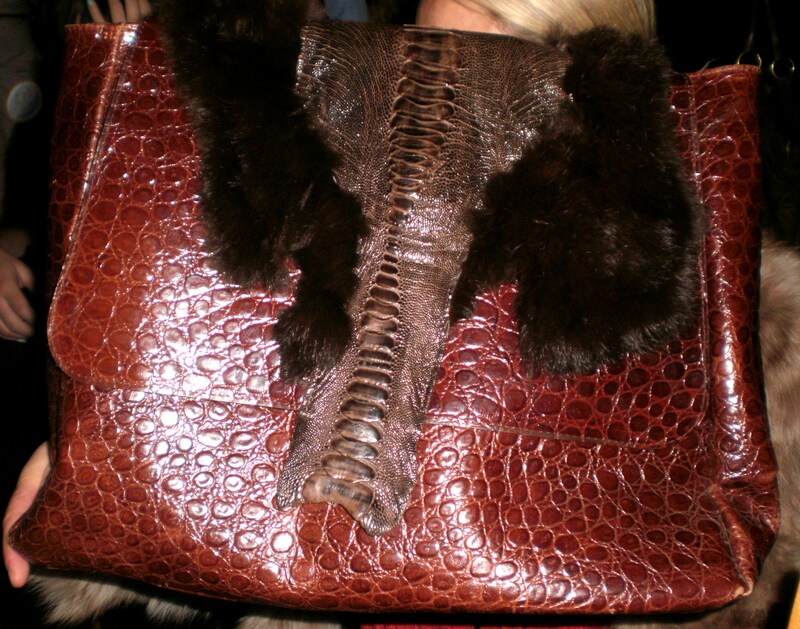 Australians don’t associate leather with luxury, so why fur? In Europe, the attitude exhibited towards fur is markedly different – for some chilly euro-people fur is as utilitarian as a Kathmandu goose-down jacket. Furs are of varying qualities, with rare furs fetching the price of apartments. A 3/4 sable coat will cost approximately $450,000 whilst a similar coat of chinchilla would cost $250,000. Ouch! 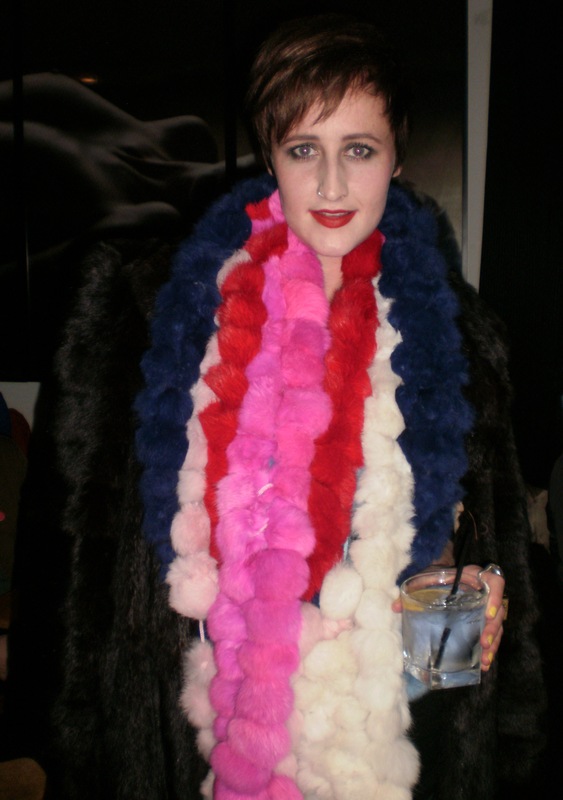 Fur on Fur by Stephanie Margaret: Vintage coat from random country town and coloured rabbit scarf *by the look of it*. Towards the end of the evening the discussion of vintage furs versus new fur came to the fore. Why are people more comfortable with vintage furs? Once a fur product is on the shelf, the animal has obviously died. So why does ‘time’ make a difference in our consumption? One commentator from the crowd suggested that calling fur ‘vintage’ meant that we abrogated our responsibility for understanding the origin of the animal and its welfare. The largest body of furs on the new market originate from North America or China, and are recognised under the ‘OA’ (original assurance) system. Consumers increasingly want to know the origin of animal products they consume, whether they be used as foods or clothing. In all, June’s Fashion Torque was an informed discussion and a celebration of an undoubtedly beautiful product – when produced ethically and mindfully. Fun fur everyone (I can’t get enough of these puns, fur real! ): Iolanthe from Ruby Assembly and Jane Hayes in a sumptuous fur. 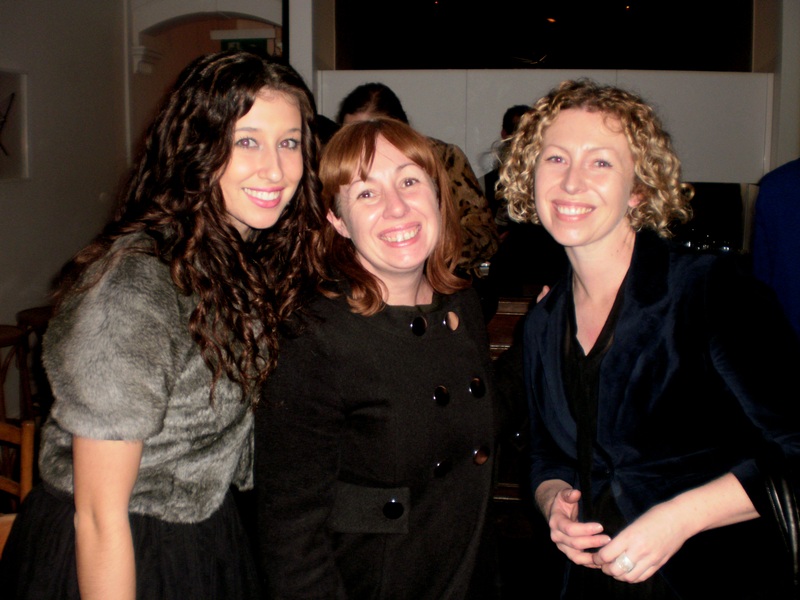 L-R: Alexandra Scoleri, gorgeous business partner of Sarah Conners, Sarah Conners. Ruby Assembly Consultants look forward to seeing you at the next Fashion Torque on the 28th of July.